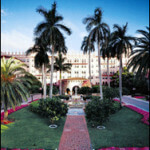 BaumanMedical.com | Follicular Unit Micrograft & FUE Hair Transplant in South Florida--Welcome! “It is an easy, painless procedure that really works. If having fuller hair is important, have this surgery and use Dr. Bauman. Our normal hours of operation are Monday through Friday from 9am to 4:30pm, ET except holidays. Procedures are performed starting at ~7:00am each day. Dr. Bauman is available for private, one-on-one consultations starting at 1pm. Preliminary “Virtual Consultations” using email, digital photos or online video-conferencing (e.g. skype) are available by appointment. Laser Therapy sessions are typically available during normal business hours and must be scheduled by calling our office for an appointment. Post-surgical patients can reach Dr. Bauman 24/7 by calling our main phone number below. For general information, appointment scheduling or questions, please call 561-394-0024 or 1-877-BAUMAN-9 (toll-free). or Email Dr. Bauman directly. “I can’t say enough about Dr. Bauman’s skill and integrity. See Some of Dr. Alan J. Bauman’s Before & After Results! This week, Dr. Alan Bauman discusses the mechanisms of low level laser therapy and how lasers can help men and women with thinning hair on the Emmy Award-winning show, The Doctors. with Hair Loss Expert: Dr. Alan BaumanWednesday July 24th, 2013 7amE/PTune in to watch Dr. Bauman discuss the latest hair regrowth treatments and procedures available that Hollywood celebs are using to help maintain, enhance and restore thick full heads of hair as well as achieve beautiful eyebrows and luscious lashes.Technology like powerful at-home Laser Therapy with LaserCap, compounded prescription medication like Formula 82M, Viviscal Pro and pharmaceutical-grade nutritionals, FDA-approved medications, ‘Vampire’ PRP platelet rich plasma as well as state-of-the-art minimally-invasive no-linear-scar NeoGraft FUE hair transplants. Celebrating its 14th year, the public education campaign of the American Academy of Dermatology (www.aad.org) is designed to raise awareness of the signs and symptoms of hereditary hair loss and the effective treatments and procedures available. This year, Hair Loss Awareness Month holds special meaning for the estimated 60 million men and 40 million women in the U.S. who suffer from thinning or receding hair, as hair restoration therapies continue to improve. 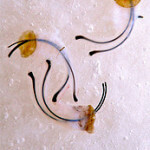 Members of the International Society of Hair Restoration Surgery (www.ishrs.org) are now more adept than ever at helping their patients achieve their hair restoration goals by using a combination of early diagnostic evaluations, effective non-invasive FDA-approved therapies, powerful compounded medications, like Formula 82M Minoxidil, Compounded Finasteride (FinPlus), PRP Platelet Rich Plasma and less-invasive hair transplant procedures, like FUE/NeoGraft.New diagnostic tools include HairDx genetic hair loss testing, scalp microscope evaluation with HairCam, hair growth measurements with HairCheck. New laser therapy devices include the portable, hands-free LaserCap low level laser therapy device. New hair transplantation devices include the NeoGraft for no-scalpel/no-stitch “FUE”-type hair transplant harvesting.Hair loss sufferers are encouraged to seek advice from hair restoration physicians certified by the ABHRS (www.ABHRS.org) recommended by the American Hair Loss Association (www.AHLA.org). 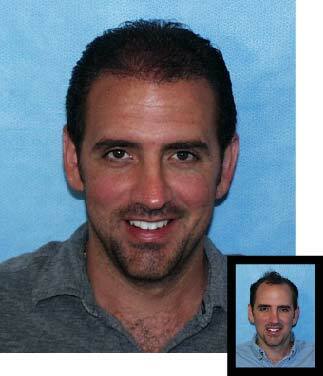 NeoGraft enhances the speed, efficiency and quality of FUE (no strip scar) hair transplant procedures. The mechanical device, guided by the surgeon’s hand, allows the individual extraction of hair follicles without the need of of a scalpel or stitches and leaves no linear scar. The procedure is less invasive than traditional strip or harvesting and heals more comfortably and quickly. The procedure still demands experience and artistry, so choose your surgeon carefully. Recently, YouTube celeb, Kevin ‘Nalts’ Nalty, had his surgery using NeoGraft broadcast live on the internet and is documenting his hair transplant growth and results with videos. Dr. Bauman was the first ABHRS-certified hair transplant surgeon to use NeoGraft routinely for his hair transplant procedures and is the most experienced NeoGraft surgeon in the U.S.Are you a candidate for NeoGraft FUE hair transplant? For more information on NeoGraft, please email Dr. Bauman directly at Email Dr. Bauman or request a consultation. ABC Television News Station WPBF Channel 25 in West Palm Beach recently reported on the HairCheck ™ device and Dr. Alan Bauman’s new Hair Coach program, which offers innovative solutions for hair loss sufferers, cosmetologists, salons and spas.Watch the TV news report on HairCoach and HairCheck.What is a HairCheck™? Internationally Renowned Hair Transplant Surgeon, Dr. Alan Bauman, Adopts Revolutionary FDA-Approved Pain-Eliminating Technology, the BellaNovus “Ouchless Needle,” for Hair Transplant ProceduresBoca Raton, Florida–A recently FDA-approved device originally created to eliminate pain associated with the use of needles and syringes for common dermal fillers and neurotoxin injections such as Botox®, Dysport®, Juvederm,® and Restylane® has now been adopted for use by Dr. Alan J. Bauman, the nation’s leading hair transplant surgeon, for use in his hair transplant procedures. “The Ouchless™ Needle is the final ingredient in modern hair transplantation surgery that will serve to completely eliminate patient concerns about the issue of pain associated with the hair transplantation process,” says Dr. Alan J. Bauman.The Ouchless™ Needle (BellaNovus) is a disposable syringe-attachable dispenser that delivers a precise stream of the numbing vapocoolant to the skin just ahead of the tip of the needle before the skin is pierced. The vapocoolant spray immediately refrigerates the skin, thereby reducing the feeling of needle penetration and making the injection significantly more comfortable. This new medical technological device works to instantly reduce the pain associated with having injections and, according to clinical trials, minimizes post-injection numbness, swelling and bruising thereby providing patients a far superior treatment experience.If you are interested in learning more about the Ouchless™ Needle for Hair Transplant, please email Email Dr. Bauman or start your Virtual Consultation today. Allows for No-Scalpel, No-Stitch Harvesting! Los Angeles, CA — KABC-7 reports hairstylist and salon owner “Bobby Jr.” chooses Dr. Bauman to restore his thinning and receding hairline using the NeoGraft FUE hair transplant technique. NeoGraft FUE heals faster, more comfortably and leaves absolutely NO linear scar. A quicker return to athletic activity and short haircuts make this an ever-increasingly popular option for men and women looking for a permanent solution to hair loss. NeoGraft enhances the speed, efficiency and quality of FUE (no strip scar) hair transplant procedures. The mechanical device, guided by the surgeon’s hand, allows the individual extraction of hair follicles without the need of of a scalpel or stitches and leaves no linear scar. Recently, YouTube celeb, Kevin ‘Nalts’ Nalty had his surgery with NeoGraft broadcast live on the internet. Videos of his procedure can be found atwww.hairofnalts.comSee some Neograft before and after photos. Recently, with Dr. Bauman’s help, Men’s Health Magazine reviewed the hair loss basics of ‘keeping the hair you have’ and ‘restoring the hair you’ve lost.’ Both FDA-approved as well as “off-label” treatment options were discussed. It is well-accepted by Hair Restoration Physicians that most men will need a combination of medical treatments to stop the progression of hair loss, as well as hair transplantation to restore hair to the thinning areas, in order to reach their goal.Over the years, Dr. Bauman’s advice has been sought by Men’s Health Magazine, appearing in articles like the one describing the advanced Hair Transplantation procedure he performed on a Men’s Health editor (visit www.menshealthhairtransplant.com to view a reprint) as well as the use of various Low Level Laser Therapy devices to treat hair loss. For years, Dr. Alan Bauman has been listed amongst “Top Doctors” by Boca Lifeand the Gulfstream Media Group of South Florida. Dr. Bauman is an internationally recognized and ABHRS-certified Hair Restoration Physician, Medical Advisor to Men’s Health Magazine, a frequent medical expert on NBC’s Today Show and recommended by the American Hair Loss Association. Since 1997, his specialty practice has been an international destination for hair loss patients looking to restore, enhance and maintain their own living and growing hair. Watch some of Dr. Bauman’s educational videos and news stories atwww.youtube.com/baumanmedical. treatments Dr. Bauman often prescribes for women. Learn more about treatments for women with hair loss. Boca Raton, FL–The new ZERONA procedure using the FDA-cleared Erchonia LipoLASER allows inch-loss with no surgery, no pain, no downtime, and no recovery. Bauman Medical Group is one of the first medical practices in the country to obtain the ZERONA device, which helps patients lose up to 9.5 inches from their hips waist and thighs in two weeks. Treatment slots are limited, soemail us for more information or call 561-394-0024. Do you find over-the-counter Minoxidil or Rogaine too difficult to use or wasn’t worth the trouble?Do you wish that the medication was available in a stronger strength, less greasy or was more gentle on the skin? Compounded Medications—can now be prescribed to Bauman Medical patients ONLY. Custom-compounded medication, like 6% & 7% and Formula 82M Minoxidil can now be prescribed. These custom formulations may be more easily tolerated and more easily used by patients and may be more effective for some patients and can be used as an alternative to Rogaine. Be aware that ‘off-label’ compounded medications, their dosages and formulations are not fda-approved and therefore may have certain risks which should be discussed with your physician. We use a trusted pharmacy to provide sterile, accurate and quality prescription medication to our patients. Email Email Dr. Bauman for more information on compounded, prescription minoxidil. 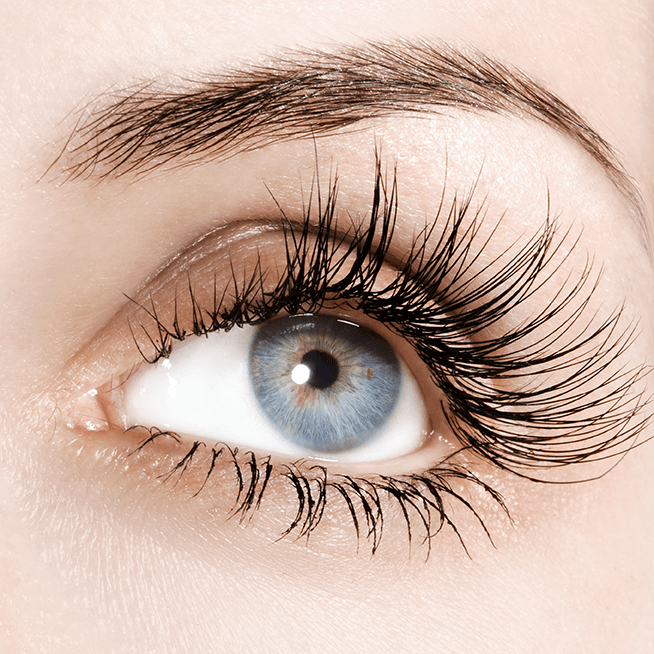 Eyelash Transplants were featured on NBC’s TODAY SHOW. Today show’s Janice Lieberman follows cancer-survivor–Veronica Garner–before, during and after her eyelash transplant procedure with Dr. Bauman. “Eyelash Stylist” Ellie Malmin, was featured in the story as she trimmed, tinted and permed Bauman patient, Erica Lynn’s transplanted lashes. Watch the TODAY Show Video. Which laser therapy device is the best choice?Often, I am asked by patients and physicians the differences between treatments, medications, procedures, medical and cosmetic devices. As part of a recent lecture on Low Level Laser Therapy given at the International Society of Hair Restoration Surgery’s Annual Live Surgery Workshop in Orlando, Florida and to other physician groups, I presented a small sampling of the features that several of the Low Level Laser Device companies distribute. The data was collected from each of the companies’ various literature on their devices, including their FDA clearance status. Each patient and physician should decide for themselves which features, functions, classifications and clearances are important. Here is one of the charts presented. Hair Loss Myths, Misconceptions and an “Anchorman” Hair Transplant…When WPBF25 Palm Beach news anchor, Jim Abath, was given his “Special Assignment: Hair Restoration,” it was more than just ‘business,’ it was personal! Having previously tried several “lotions and potions” that simply didn’t work, Jim sought the advice of internationally-recognized and ABHRS-certified Hair Restoration Physician, Dr. Alan Bauman, in Boca Raton, Florida. The three part series reviewed common hair loss/hair restoration myths and misconceptions, Dr. Bauman’s Multi-Therapy approach to hair restoration, the results several of Dr. Bauman’s patients and Jim’s personal journey through the hair restoration process–including his own two hair transplant procedures. HEALTHY HAIR: LEARN ABOUT WHAT LOW LEVEL LASER THERAPY CAN DOWhile many hairstylists are familiar with FDA-approved medications such as Rogaine and Propecia, as well as various thickening products, few salon professionals are familiar with Low Level Laser Therapy devices and their use in treating clients with thinning hair. If you are a cosmetologist or hairstylist and would like to learn more about the FDA-approved medications, the FDA-cleared medical device for promoting hair growth, as well as other devices and treatments which can promote stonger, thicker and healthier-looking hair, please contact us at 561-394-0024 or email Email Dr. Bauman. Consumer hair loss advocate and best-selling author, Spencer Kobren, is the host of the popular radio talk show “The Bald Truth” and also the founder of the non-profit organization theAmerican Hair Loss Association. Listen live when Bauman patient and YouTube star, Kevin “Nalts” Nalty, discuss his hair transplant procedure, which was broadcast live on the internet. Thank you to all who tuned in to watch the live Hair Transplant Surgery webcast on November 18, 2011. 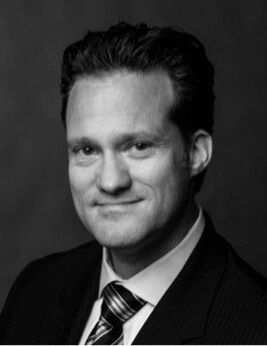 Dr. Alan J. Bauman, M.D. performed a hair transplant on YouTube celebrity Kevin ‘Nalts’ Naltyduring the first-ever Hair Transplant Webcast streamed live on the recently launchedYouTube.com/LIVE platform. The event was hosted by Spencer Kobren (The Bald Truth) and Andrew Zarian (Guys From Queens). To view, visit The Bald Truth Live Hair Transplant on the GFQ Network. 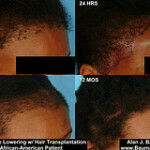 More Details are available about Live Hair Transplant Surgery can be found on Dr. Bauman’s blog. 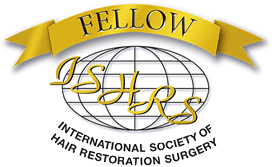 The International Society of Hair Restoration Surgery is a non-profit educational organization for physicians and as such, provides unbiased information about hair loss and treatment, including hair transplant, hair replacement & non-surgical treatment options. Dr. Bauman has been a member of the ISHRS since 1998 and has sat on the ISHRS Ethics and Bylaws Committee. 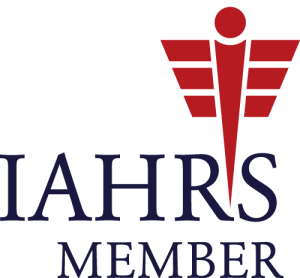 He has attended all ISHRS Annual Meetings and ISHRS Live Surgery Workshops since becoming a member of the ISHRS. Dr. Bauman is a routine lecturer at the ISHRS annual meetings and has lectured on such topics as the role of Computerized Scalp Microscopy and Densitometry (CapilliCARE) in the evaluation of hair loss, Follicular Unit Extraction (FUE/FOX) techniques, Recipient Site creation, Low-Level Laser Therapy, and others. At the Annual Live Surgery Workshop, Dr. Bauman has been asked to routinely demonstrate his surgical techniques including Follicular-Unit Extraction (FUE/FOX), Follicular-Unit Micrografting and Eyelash Transplantation. American Hair Loss Council mission is to provide education and networking with medical and non-medical professionals while supporting individuals having hair loss with sensitivity and integrity. Dr. Bauman has been a member of the AHLC since 1998. The AHLC is a non-profit organization that provides unbiased information regarding the options available for the treatment of hair loss. With the dramatic increase in the use of Laser Therapy and other methods of Phototherapy to treat a variety of medical conditions, Dr. Bauman is proud to have ben elected as a Full Member of WALT. In the past several decades, over 2400 scientific papers have been written about the effects of laser therapy. Dr. Bauman has used in-office Low Level Laser Therapy in his hair restoration practice since 1999 as a post-surgical healing adjunct and as a non-invasive option for those suffering from thinning hair. In January 2007, the FDA gave its clearance to hand-held laser therapy devices for the treatment of hair loss. For more information on what kind of results one can expect from laser therapy, click below. Keeping with Bauman Medical Group’s commitment to offering the latest treatments and procedures, at any given time there are a number of ongoing research projects that involve our patients and medical staff. While the results of some of our projects remain confidential (for some device manufacturers, for example), others have been published or have received significant news media attention. In accordance with the standards of medical ethics, all patients are informed and enrolled in our clinical trials through a detailed consent process. The patient has the right to choose whether to participate in such research projects or opt-out. In addition we are often seeking demonstration cases for live workshops and other special events. Whether you are eager to participate in these kinds of scientific trials and events or are undecided, feel free to contact us for more information about the criteria for enrollment. If you are interested in being notified of new research projects or special events when they become available, please contact Email Dr. Bauman. Check below for the status of enrollment for current research projects. 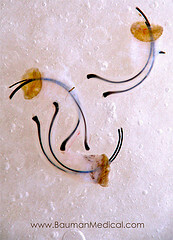 Examples of areas of ongoing research include: novel hair restoration treatments and procedures, novel approaches to hair transplantation, accelerated wound-healing protocols, novel skincare and haircare regimens, novel body-contouring/fat-reduction protocols, low level laser therapy research, eyelash transplantation and eyelash after-care, and others. Best Selling Author, The Bald TruthSince 2002, Dr. Alan Bauman has been recommended by Spencer Kobren–the most well-known author and consumer/patient advocate in the field of hair loss, hair restoration and hair transplantation. Founder and President of the American Hair Loss Association, Mr. Kobren recommends only a handful of hair restoration physicians worldwide. His book, The Bald Truth, has been translated into five languages and has become the most well-read consumer guide to hair loss of all time. For information on the elite International Alliance of Hair Restoration Surgeons or Spencer Kobren’s talk show on XM radio visit www.thebaldtruth.com, or join the community called Hair Transplant Forum at www.baldtruthtalk.com. Boca Raton, FL—Each year, the Greater Boca Raton Chamber of Commercerecognizes businesses and business people that exemplify the highest standards of leadership in the community and strong philanthropic involvement. Dr. Alan Bauman, Founder and Medical Director of Bauman Medical Group, has been an active member of the chamber since 1998. 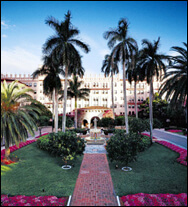 This year, Dr. Bauman is proud to be amongst those honored at the 2009 Greater Boca Raton Chamber of Commerce Awards Luncheon (Boca Raton Resort and Club | 501 E Camino Real Boca Raton | Friday, May 15th 2009 | 12noon-1:30pm) as the recipient of the 2009 Small Business Leader of the Year award. Dr. Bauman is the first physician to ever receive this honor. For information on Dr. Bauman’s local and national non-profit involvement, please click here. For information or tickets to the event, please visithttps://www.bocaratonchamber.org. For those who can attend, we all look forward to seeing you there! NEW: See Dr. Bauman's Before & After Hair Transplant Results! More of OUR PATIENTS "Before & After"
You can speak to us by phone during normal business hours: 9AM to 4:30PM ET, Monday-Friday, by calling 1-877-BAUMAN-9 toll free or 561-394-0024, or via email anytime:Email Dr. Bauman. Dr. Alan Bauman answers your questions on the medical management of hair loss, including the latest treatments and hair transplantation onMakeMeHeal.com. Get answers to your questions on the IAHRSHair Transplant Info Center. Bauman Medical Group is proud to be listed on Thumbtack! Dr. Bauman has extensive experience in helping men and women of all ages and ethnicities. 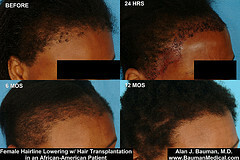 These FUE grafts (seen above) from an African-American patient were harvested at Bauman Medical Group by Dr. Alan J. Bauman.